LONDON – The Shanghai aluminium price hit its lowest level since October 2016 on Wednesday. At a current 13,700 yuan per tonne the most active contract on the Shanghai Futures Exchange (ShFE) is down by 13 percent from the start of January. The London Metal Exchange aluminium price has also been under pressure from bearish funds but is down by a relatively mild 6 percent on the start of the year. Aluminium's persistent price weakness is compressing producer margins everywhere but the pressure is greatest in China and there are signs that it is claiming ever more smelter victims. 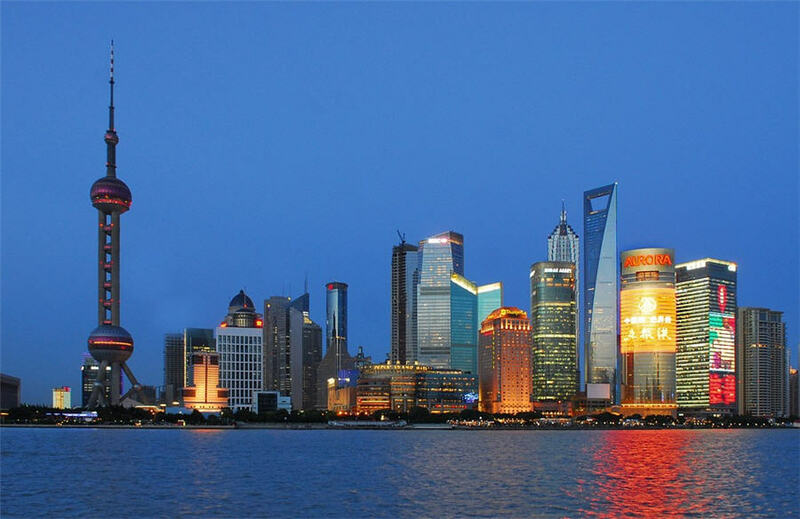 Chinese production dropped sharply last month, according to the International Aluminium Institute (IAI), and unless the Shanghai market can break out of its downtrend, more smelter casualties seem likely. The flip side is that the aluminium market probably doesn't need to worry much about the impact of this year's winter heating season restrictions in China since price has taken over from smog as the key driver of short-term output trends in the world's largest producer. Hedge funds don't much like aluminium's short-term price prospects. All the LME base metals have found themselves the wrong side of the trade war trade, as short-sellers bet on economic slowdown, particularly in China, to dampen demand. Aluminium's own dynamics are soggy with falling but still large off-market stocks, plentiful scrap supply and growing confidence that a U.S. sanctions deal will be reached with Russian producer Rusal. Chinese speculators don't like aluminium either and, in Chinese style, they're expressing their view by moving to other markets. The most recent three-month slide in the Shanghai price has been accompanied by a noticeable drop in trading activity on the ShFE aluminium contract. Volumes in October slumped 37 percent from last year, while cumulative volumes in the first 10 months of this year were down by 25 percent. The looming seasonal slowdown in demand and expectations of a limited supply hit from this year's winter heating season restrictions are unlikely to entice investors back any time soon. The Shanghai aluminium price is now at a level where significant numbers of smelters are suffering extreme margin compression. Some are closing. Two smelters in the province of Qinghai with combined capacity of 270,000 tonnes per year have gone off line in the last couple of weeks, according to BMO Capital Markets. BMO estimates total closures this year now amount to around 1.8 million tonnes of smelter capacity. The pace seems to be quickening as the price continues sinking. The latest IAI estimates of Chinese production suggest a sharp month-on-month drop in average daily output to 98,390 tonnes in October, the lowest national run-rate since March. 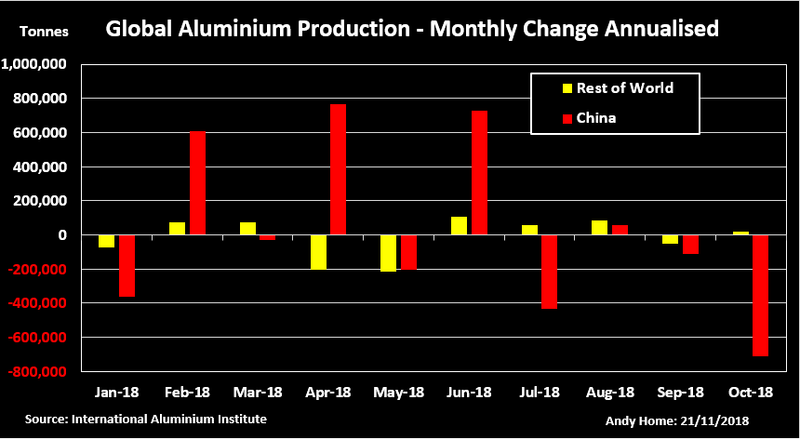 Annualised production has fallen by almost 1.2 million tonnes since June with price pressures interacting with Beijing's ongoing structural reform of its aluminium industry. The official production figures released by the National Bureau of Statistics are consistently lower than those of the IAI but they too indicate declining production over the last three months. Average smelter production costs in China are now 800-1,000 yuan-per-tonne above the current metal price, according to Paul Adkins of aluminium consultancy AZ China. Chinese smelters have been here before, most recently in 2015 when the Shanghai price slumped to 10,000 yuan. Back then the price was 2,000 yuan below average production costs, suggesting many producers will soldier on in the short term, according to Adkins. However, with prices still sliding and demand likely to slacken into the Chinese winter, "it's only a question of when" more curtailments happen, he said. Price has overtaken pollution as the key determinant of Chinese production dynamics over the coming months. The impact of last year's blanket curtailments on heavy industries, including aluminium, in the region around Beijing over the winter heating months underwhelmed the market. Several key producers persuaded the authorities that "illegal" capacity already closed could count towards their winter cutback targets. Demand, meanwhile, appeared to take as big a hit as production thanks to a complete cessation of building activity in the smog-impacted areas. This year there will be no central government mandate on cutbacks. Rather, each local administration will set its own smog reduction targets, a policy shift widely expected to lessen further any hit on aluminium production. On paper at least, production of the raw material alumina could be more vulnerable to winter heating restrictions this time around. But as Adkins of AZ China points out, "the irony (is that the alumina) refineries that were ordered to close 50 percent for winter were already running at half pace due to lack of bauxite." Another reminder that China's environmental crackdown is continuing with bauxite, the first input into the aluminium-making process, just one of many mining targets for Beijing's inspectors. Although there will be winter curtailments of both operating aluminium and alumina capacity, the impact of lower prices on an already strained production chain is going to be greater. China's share of global aluminium production is undiminished at around 56 percent in October. That's in part because production outside of China is doing no more than creep very gently higher. The rest of the world's output in the first 10 months of this year was up by 1.7 percent on last year, according to the IAI. October's annualised run-rate of 26.1 million tonnes was just 200,000 tonnes higher than that in October 2017. Smelter restarts in the United States on the back of import tariffs are still being largely offset by outages in Canada, Brazil and margin cost attrition at some of the world's smaller plants. For now, in other words, China remains the dominant force in global aluminium production trends, which is why it's worth keeping a close eye on that sinking Shanghai price.